Plenty of people who run central air conditioning systems in Houston (and other cities where hot weather dominates the calendar) complain about how their air conditioning doesn’t do a good job keeping their home comfortable, and, in most cases, they are probably right. There are so many things that can and do go wrong with central HVAC systems that it’s tough to know where to start, but I’ll give it a shot. Probably the single biggest cause of poor A/C performance is leaky ducts. Ducts are kind of like pipes, but for air, not water. We notice when our water pipes leak because we see the damage immediately, but we rarely see the effect of leaky ducts so obviously; rather it sneaks up on us over time, and many people never figure it out. When ducts leak, they let cool air out into whatever space they're in, often the attic, which, in case you haven’t noticed, can get pretty hot in summer. Ducts need to be sealed at all the metal-to-metal and metal-to-flex connections – not at the insulation. Have someone pull back all the insulation and put a nice thick layer of goopy mastic at all the joints, then replace the insulation. Don’t use duct tape. It won’t work, and the metal tape designed for ducts doesn’t do a whole lot better. Something else that can make your AC inefficient is the refrigerant charge. 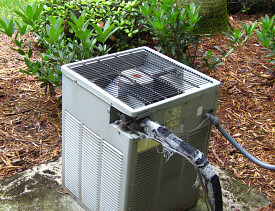 Traditional A/C uses a refrigerant that transfers the heat between the inside and the outside. Each system is designed to work efficiently with a specific amount of refrigerant, and too often there is either too much or too little in the system. A good HVAC contractor can check the charge and either add or remove some to make sure it is set correctly. A wrong charge may decrease the efficiency by 20-30%, so checking and fixing this might make a big difference. Make sure you have the right filter installed. Most HVAC systems were designed to use one of those cheap fiberglass filters to clean the air. Unfortunately, they don’t do a very good job, so many homeowners go to their local hardware or big-box store and buy a super-duper high efficiency pleated paper filter GUARANTEED to keep their air cleaner. It might actually keep the air cleaner, but it also cuts down on the air flow, making the whole system less efficient. It can cause the cooling coils to freeze, creating even bigger problems. If you really need a good filter, first seal the ducts to keep the air in and the nasty stuff out, then get a 6 inch thick pleated filter which fits into a special cabinet which your HVAC contractor can install for you. That will do a good job filtering the air and won’t cause problems with the air flow. The last thing I’m going to talk about is return ducts. Lots of HVAC systems are installed with a single large return somewhere in the middle of the house. Each room has its own supply, but the air is supposed to, sort of magically, slide under the door and get back to the big return duct to be cooled again. The problem is the space under the door usually isn’t big enough, so the air doesn’t flow through the whole house well enough to keep things evenly cooled. Some rooms are hot, some are cold, and none are just right. Consider having an HVAC contractor add some extra return ducts in bedrooms and other rooms with doors (except for bathrooms) to give you better air flow and increased comfort. Notice that I haven’t said anything about equipment efficiency. That’s what the manufacturers and installers talk about, because they can make a lot of money selling you fancy, expensive air conditioners that are super efficient. The problem is, if you put one of those on a system that is otherwise pretty crappy, you've wasted most of the super duper efficiency you paid for. Take care of the more boring, tedious, and important things like these first, before you install new equipment. You’ll be much happier, and more comfortable. Then when you want to put in that super duper equipment, you’ll have a really good HVAC system.